The AX3007 series are monolithic IC designed for a step-down DC/DC converter, and own the ability of driving a 2A load without additional transistor. It saves board space. The external shutdown function can be controlled by logic level and then come into standby mode. The internal compensation makes feedback control having good line and load regulation without external design. Regarding protected function, thermal shutdown is to prevent over temperature operating from damage, and current limit is against over current operating of the output switch. If current limit function occurs and VFB is down below 0.5V, the switching frequency will be reduced. The AX3007 series operates at a switching frequency of 150KHz thus allow smaller sized filter components than what would be needed with lower frequency switching regulators. The output version included fixed 3.3V, 5V, 12V, and an adjustable type. 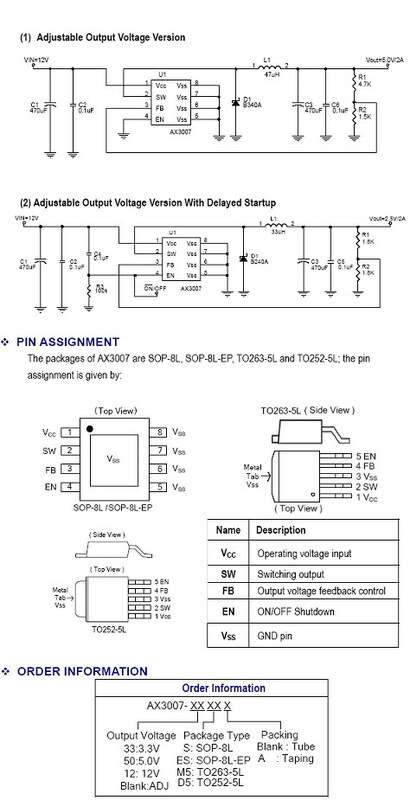 The chips are available in standard 8-lead SOP, SOP8 with Exposed pad, TO263-5L and TO252-5L packages. - Output voltage: 3.3V, 5V, 12V and adjustable output version1. - SOP-8L, SOP-8L-EP, TO263-5L and TO252-5L Pb-Free packages.